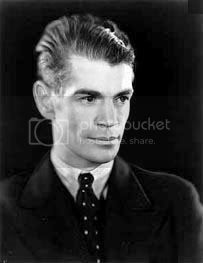 James Whale was a British-born American director, and one of the few gay men of early Hollywood to be openly homosexual. He lived with his partner, producer David Lewis, between approximately 1930-1952. James Whale was born July 22, 1889 in Dudley, England. At the onset of World War I he entered the British Army and became an officer. He was captured by the Germans and interred in a POW camp where he directed plays with the other soldiers to pass the time. Finding a new love in this field, he became an actor, set designer and director after the war. He directed the successful play "Journey's End" at the West End Apollo Theatre in December 1928. Whale discovered the unknown 21-year-old Laurence Olivier to play the role of Stanhope. The London produced continued for two years at the Savoy and Prince of Wales Theatre, while James moved to New York to produce the play on Broadway. It was first performed out of town at the Great Neck Playhouse. James also hired Shakespearean actor Maurice Evans who, despite a highly successful stage career, would today be better remembered as "Maurice" - the father on the TV show "Bewitched" and as "Dr. Zaius" in "Planet of the Apes." Maurice may have also been gay, his characters were often effeminate and he never married. After "Journey's End" was underway on Broadway, James moved to Hollywood and signed with Paramount Pictures. He was assigned as a "dialogue director" for "The Love Doctor" (1929). It was around this time that James met his partner David Lewis. Only two shows survived New York's recent disastrous theatrical season. One was "Street Scene." The other an English play, "Journey's End." Critics hail "Journey's End" as a personal triumph for James Whale, young Londoner, who directed it. It was inevitable that Hollywood should call him. Paramount has just placed him. Star Unavailable For "Hell's Angels"
Unable to secure Dorothy Mackaill for the same part played by Greta Nisson in "Hell's Angels." because of the former's present Warner film, Caddo has been forced into another delay on the air picture. Silent version is already completed, but cannot be released until scenes where dialog is nesessary can be made. Original cast, with the exception of Miss Nisson, will be used in the talking version with James Whale borrowed from Paramount do direct. More than 2,500,000 feet of negative has been shot on this picture. Were it not for the system used in cataloging the negative, making it possible to pick any scene at a moment's notice, it would require a year to match the negative with the master positive print. Here, as Williams Slavens McNutt might say it, is the payoff. Two years ago Howard Hughes, the oil millionaire, started to film "Hell's Angels." He almost had it finished when in came the talkies. Now he is remaking certain parts of it that require dialog. Hughes has borrowed from Paramount James Whale, young Englishman, who directed "Journey's End" in New York. Whale will direct the dialog re-makes of this hardy film feature. Hollywood, Feb. 7 - Tiffany's "X Marks the Spot" can't get started Feb. 10, as announced. James Whale, directing, started casting and found all the types he wanted for gangsters were playing newspaper reporters in Howard Hughes' "Front Page". The most startling bogy man ever conjured by make-up men is admitted by those who have seen it to be the monster in Universal's forthcoming "Frankenstein." James Whale, the director, and the studio gave Jack Pierce, make-up man, orders to go the limit and Pierce did. In the story the monster is a handmade man, put together by a physciologist, and the character make-up of Boris Karloff, who plays the part, carries out this idea. On each side of his neck is a metal button, supposed to be the ends of the rod on which his head is fastened. On the forehead are clips and scars where, the story goes, top of the monster's head was fastened on. Big boots, weighted with lead, are worn by Karloff to keep him from tipping over, as the hand-made man had no sense of balance. A scar on one wrist, where one hand was sewed on, and a metal clasp on other wrist where the other hand was riveted on are other details. Studio isn't permitting anybody to see Karloff in make-up, the actor going to and from his dressing room under a cape. It takes two and one half hours to apply the make-up and is calculated to be the most terrifying character ever screened. There are no fogs, comic butlers, or unnecessary umbrellas in scenes of London that are included in James Whale's picture! The English director, who filmed the Eckel-bound "Waterloo Bridge" is Hollywood's chamption of "de-bunkizing the English pictures," and sincerely avers that "Waterloo Bridge," like "Journey's End" present authentic Englishmen and authentic England. "Waterloo Bridge" is a screen version of the Robert E. Sherwood play with Mae Clarke, Kent Douglass, Doris Lloyd, Frederick Kerr and Bette Davis in the cast. 'Frankenstein's' Director First Turned to Stage While German Captive. James Whale, the distinguished Englishman, who is rapidly earning the right to wear the toga according to the motion picture screen's premier director, was born in Dudley Staffs, England, on July 22, 1896. Imprisoned by German troops for two years during the World War, Mr. Whale took up the drama chiefly as a prison-camp diversion at Holzminkin, but soon saw clearly that his life's work was the theater, and not newspaper drawing or his other previous professions. Mr. Whale made his first professional appearance on the stage after the signing of the Armistice, in the Birmingham, England, presentation of "Abraham Lincoln," and his London debut soon followed in "A Comedy of Good and Evil." Hit followed hit for the Britisher until the advent of "Journey's End," and sensation followed hit in that case. The American stage and screen versions of the great war play are well known to theatergoers, and "Waterloo Bridge," his latest hit of War-time London, brought him new laurels. Mr. Whale had deviated from any sort of production with which he has been connected in the past with the making of "Frankenstein," which currently appears at the Fox-Eckel. He calls it his most interesting study and work. If there ever was a picture that was away from the beaten track, it is "Frankenstein." "Dracula" blazed a path which Carl Laemmle, Jr, found a very popular one. As a follow-up, "Frankenstein" is convincing fans that young Laemmle has out-Draculaed "Dracula." HOLLYWOOD (AP) - Motion Picture Director James Whale, 60, where films included "Frankenstein," "Hell's Angels," and "Show Boat," was found dead in his swimming pool. His death was listed as a possible accidental drowning pending further investigation today by the coroner's office. The English-born director, who had not been active in the movies in recent years, was found yesterday fully clothed in the pool behind his home. There was a cut on his head, apparently suffered when he fell, police said. Whale came to Hollywood in 1929 after having performed as an actor and director on the London stage. He made his last movie in 1941. HOLLYWOOD (AP) - The director who filmed the original screen version of "Frankenstein" died Wednesday after falling into the swimming pool of his home. Police said a maid at the home of 60-year-old James Whale telephoned friends when the British-born director failed to appear for lunch at his home in Pacific Palisades, a suburb of Los Angeles. The friends found the body in the pool. Whale's hits included "Waterloo Bridge," "The Invisible Man," "Hell's Angels" and "The Road Back." While serving in the war as a lieutenant in the 7th Worcester Inf. he was captured by the Germans. He took part in prison stage productions and turned after the war to a stage career. He appeared as an actor in London productions, including a version of "The Cherry Orchard," become coming to New York in the late 20s to direct "Journey's End." He made his movie version of the play in 1929 in Hollywood. A year later he directed Boris Karloff in "Frankenstein". In 1936 he directed that year's screen version of "Show Boat." His last film was "They Dare Not Live" in 1941. He had been retired in recent years and had been in ill health, friends said. film director, residence in U.S.A.
Next of Kin: Father W. Whale, 4 Park Hill St., Dudley, Wors.